What a change with the Dow Jones Industrials leading stocks higher. It felt like yesterday that Turkey was going down and about to take the whole world with her. Turkey remains an issue as does the emerging markets complex or at least those countries which have borrowed too much money denominated in dollars. With the dollar’s recent resurgence those debts are more expensive to pay when your own local currency declines. Anyway, that’s a big picture problem that’s only going to worsen over the coming years. The dollar may pause or pullback, but it’s not close to being done going down. Speaking of the strong dollar, it has really caused a collapse in gold or maybe it’s coincidental. For weeks I have mentioned keenly watching gold for signs of the bottom and I didn’t expect gold to collapse this far to the point where it’s so bad, it becomes good. Smart money has been buying. Dumb money has been selling. Sentiment is at historic lows. One more trip to new lows could hammer in the bottom. And while on the topic of the dollar, a long time client asked if I am standing by my forecast that the Euro goes to par (100) and then to all-time lows below 78 against the greenback. The short answer is yes. I am not wavering one bit. Getting back to stocks, you have to give credit to the bulls; they have thwarted every attempt by the bears this month. Four of the five major indices (not dentists surveyed) are within a day of all-time and the laggard, the Dow, is now leading. Yet, I still do not believe stocks have begun the next 10% assault higher. They are quietly moving up but I think they will pullback before rocketing higher again. For the next few days, besides gold, I am keenly watching to see if the semis can muster some strength and get back in line with the bulls. That would be an important short-term development. Turkey this, Erdogan that. I would bet that the vast majority of Americans have absolutely no idea where Turkey is on a map. But, that country is in almost every financial story this week. Seeing the name so much subliminally made me order a turkey burger for lunch today! While stocks are beginning the day much lower, I think the news about a Chinese economic slowdown may be more important. In any case, as we know, stocks can never just go down on their own. There always has to be some reason. One my favorite myths in investing (I am about to begin an e-book on myths) is that stocks cannot go up in a rising dollar environment. Sure they can, have and will, sometimes. Here is a chart of the dollar over the past four months. Boy, does it look strong! That’s about a 9% rally which is huge in the currency markets. If you take a longer-term look, the rally looks less and less impressive. In fact, over the past year, the dollar is essentially flat. 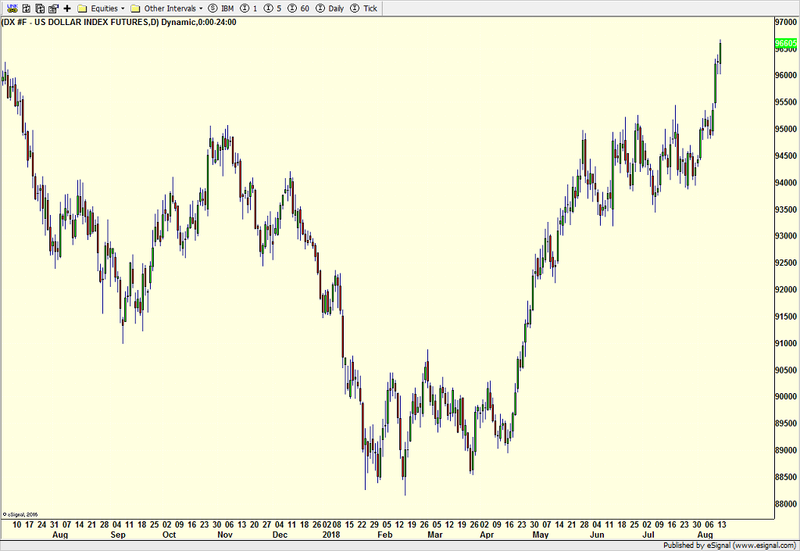 Most readers know that I turned very bullish on the dollar when Bear Sterns was about to go out of business in 2008. Over the long-term, I have never wavered on that optimism and still won’t today. On balance, I continue to believe the dollar is going much higher over the coming years. More on this later. For stocks, volatility is certainly the theme of the week. I think the short-term risk is to where prices were just below their lows in late July. Emerging markets and commodities have been decimated and they need to stabilize before stocks can mount any kind of rally back near the old highs. 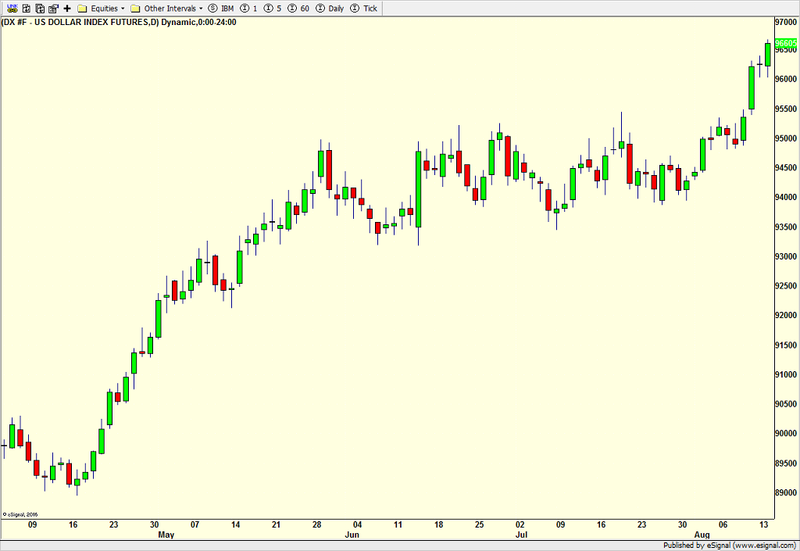 Gold and silver are about as ugly as they ever get and I am still looking for the elusive bottom. Perhaps on Thursday. And before you ask, no, I don’t believe the bull market is over. More new highs lay ahead! The bulls had their wings clipped on Friday, making it three straight down days for stocks although the bears haven’t made much progress just yet. The macro concern right now is the collapse in the Turkish Lira. Similar to Greece and Cyprus, Turkey by itself has the economic output of Connecticut and the world really doesn’t care what some crazy dictator does to his country, per se. However, any time there is a crisis in the emerging markets complex, two things spring up. Will there be contagion? And do the major global banks have exposure? The answer to the first question is probably not. The second questions is yes, and mostly in Europe where banks were all warm and fuzzy to the 20% interest rates being offered not long ago. Now, not so much! All of the major stock market indices look like they want to trade a little lower before mounting a counter offensive. There is no clear cut leadership although the NASDAQ 100 is trying hard. Sector leadership remains unchanged with discretionary leading followed by transports. Banks are neutral and semis are on the defensive which seems odd with the tech-laden NASDAQ 100 trying to lead. Let’s keep an eye on Tuesday as a possible day for a short-term rally to begin. I keep saying to watch gold for signs of the bottom and that remains a theme. It looks like the metal in the “puke” stage where it is being sold almost indiscriminately. A low should be forming sooner than later.